Do You Recognize the 11 Warning Signs of Hip Dysplasia? – ComeHereBoy! Do You Recognize the 11 Warning Signs of Hip Dysplasia? Hip dysplasia is a condition that plagues many large breed dogs. St. Bernards, Newfoundlands, Rottweilers, Chesapeake Bay Retrievers, Golden Retrievers, German Shepherd Dogs, Labrador Retrievers and more can all be affected by it. Hip dysplasia occurs when the head of the femur doesn’t fit into the socket of the pelvis properly. It is classified as a genetic trait that is affected by environmental factors. OFFA.org has a bunch of pictures that illustrate the different “grades” of hip dysplasia. 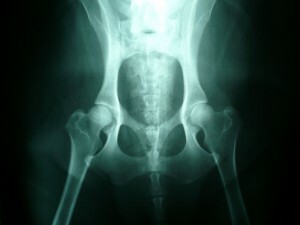 Luckily, hip dysplasia can be identified through x-rays. Better yet, it can be more easily avoided by obtaining a dog through a reputable breeder that gets OFA certification. This is one of many reasons that backyard breeders are not a great source for puppies. They are in it to make a quick buck, and since genetics testing and x-rays don’t come cheap, that’s money out of their pockets. A backyard breeder is unlikely to provide any compensation if this condition surfaces in their dogs while a breeder that invests in their reputation will provide a refund or replace the dog. Professional breeders will include these provisions in their contracts, since they care about the dogs they breed, are committed to providing their animals with a good home and making sure you are satisfied. Puppies can show signs of dysplasia as early as 4 months old, though some never show signs or don’t show signs until later. Do you know what the 11 warning signs of hip dysplasia are? Here’s an illustrative video of a Rottweiler with hip dysplasia. You can see that his leg almost seems to slip out from under him when he walks and it kind of does it’s own thing. That’s because the hip doesn’t fit tight and the muscles are loose. Hip dysplasia is a sad thing to watch. However, keep in mind that a dog’s environment play a part as well. As a responsible puppy owner, you can help your puppy be less likely to develop it by following some steps. How Can I Avoid Hip Dysplasia? Provide a healthy diet that will keep your puppy from growing too fast. An adult or all-life stages food can be good for this; consult your breeder for suggestions. Keep your dog or puppy at a healthy weight. Don’t let your puppy jump up or down for treats or to get in/on anywhere. Don’t take a puppy under 1-2 years old for long/hard runs, especially on pavement. No rough play under 1 year old. If you notice signs of hip dysplasia, make sure to take your dog to the vet to get a confirmation as soon as possible. The sooner you get a diagnosis, the quicker you can start treating it to avoid pain and expensive treatments. Help your dog lose weight by restricting calories. Short walks, swimming and training. All are low-intensive exercises that will help keep muscles strong without increasing the severity of the dysplasia. Keep your dog away from situations that can injure hips, such as slippery floors. Heated beds to help relieve pain. Hip replacement or other surgery. Take care to exercise an affected dog moderately, because lax muscles can actually make hip dysplasia worse! With some general knowledge and prevention on your part, you should be able to avoid this painful and expensive disease from affecting your dog.